THONON - Waterfront Property. 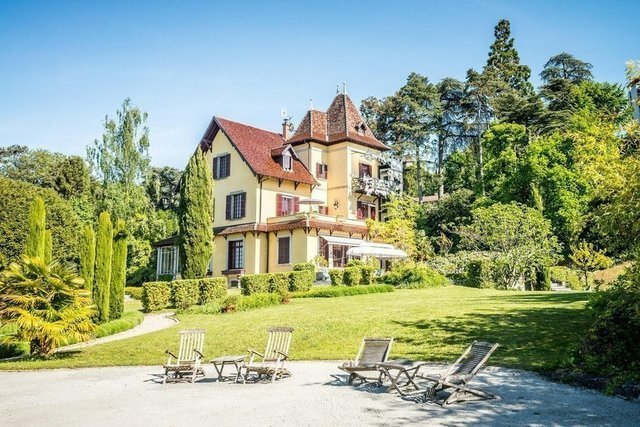 Beautifully renovated 19th century mansion with exceptional location directly on the French shores of Lake Geneva. It is surrounded by a lovely garden and century old trees on 3400 sq. m of land and is within a short walking distance from the center of Thonon. It offers around 500 sq. m on three levels (with elevator), a basement and 15 rooms. On the ground floor it offers a hall, a large living room with fireplace, a living room with access to a large terrace, a veranda, a bedroom and a large separate kitchen. The main rooms have 4 m high ceilings. On the first floor there are a master bedroom, 3 bedrooms, 2 bathrooms and a terrace overlooking the lake. The second floor is composed of a living-room and kitchen, 5 bedrooms, 2 bathrooms which can be accessed separately as an apartment. In addition it has a large covered balcony with breathtaking views. In the basement there is large room with beautiful stone walls for exhibitions, leisure or sports. The attic, balcony, ground and 1st floor terraces, workshop, storage and garage provide an additional surface area of 250 sq. m. On the waterfront there is a pergola, a private access to the lake including a 14 m long dock for a boat.